Designed for convenience and ease of use, the Browning Recon Force XR captures awesome footage. 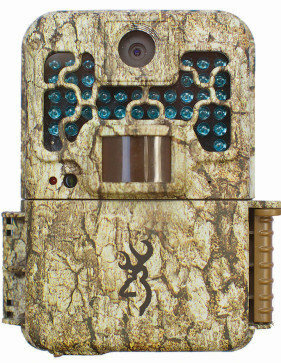 This trail camera lets you observe elusive wildlife both in crisp 8 MP images as well as exceptional full high definition video. It packs genuine value for money with plenty of features that you can optimize to catch that dream buck of the season. There’s nothing more exasperating than looking at elusive wildlife and not knowing how big they are and what features they have to distinguish them from others. A lousy trail camera will have you virtually hunting blind with very poor image quality, but the Browning Recon Force XR has been engineered to ensure you’ll get none of those headaches and problems. Offering crisp resolution during darkness and daylight, this trail camera delivers awesome 8MP image resolution. It is also able to record high definition video clips with audio, so you get an idea of the vocalizations of the animals in your property. This model also comes with a fantastic 50-foot flash range with infrared illumination for night time image capture. It will surely not miss any of the action caught within its intended coverage, The Zero Blur technology ensures great quality images no matter what time of day they are taken. Stacked with some of the best features in this product category, the Recon Force XR offers big performance in a small package. Measuring just 5″H x 4″W x 2.5″, this trail camera is quite easy to position on the site. It is effortless to carry around the property when transferring from one location to another, so it can easily be placed among your other hunting surveillance gear. The small size makes the trail camera easy to position in the bushes or on a tree so it can start capturing photos and videos of deer moving along the trail, allowing you to get really close with trophy game animals. With its fast trigger time of less than one second, this trail camera is able to take stunning photos of animals as they move about. It records two-minute high definition video footages with sound, allowing you to observe how trophy game animals behave and their travel and feeding patterns. This will prove helpful when you have to create plans on how to capture them when they are the least aware or unguarded. The time lapse function lets you enjoy both video and photo capture at preset time intervals so you will be able to survey the daily activity in the area with footage compressed to just a few minutes.The included Buck Watch software is an exceptional tool for managing the wildlife in your property. Able to snap up to eight multi shot images, this trail camera is also able to take up to four rapid-fire images so you always have more than enough for comparison and study. Get video lasting from five seconds to up to two minutes so you can really make the most of captured data to study patterns of behavior. This camera lets you search, save and share an image or export a video clip easily to watch with your pals. This way, you won’t have to do format conversions that can prove to be a bother when you are simply dying to show everyone what goes on in your property. Storage of plenty of images is never a problem thanks to the support for a separately bought SD card with up to 32 GB of memory capacity. This means you won’t have to regularly visit the camera to replace the storage device or transfer available images to a computer in just a few days. You can leave the camera to record activity to up to 10,000 pictures thanks to the impressively long battery life for a separately purchased set of 8 double-A batteries. You can also program the picture delay feature to only start recording when movement has been going on from 5 seconds to 60 minutes, so that no memory is wasted. The Recon Force XR ships with a 12-volt external power jack that ensures easy and convenient charging. The ¼-inch tripod socket lets you attach the camera to a separately available tripod for placement among the bushes when no tree is available for attachment. The included instruction manual simplifies installation, setup and usage, eliminating the tedious guesswork. The USB ports and TV out allow connection to a television or computer for viewing of captured videos and photos. With this trail camera, you get a reliable one year warranty from the manufacturer, which ensures you of the maker’s commitment to quality craftsmanship. Use the device to track the movement patterns of the game animals so you can decide on what plan of action to take during the hunting season.